This is another graduation card that I made for Color Throwdown 293, which uses Tangerine Tango, Pear Pizzaz, and Soft Sky. This is not generally a color scheme that I would gravitate towards, but I thought it'd be nice for a guy graduation. I used a pretty basic layout, but jazzed it up with a few embellishments. Silver Fancy Foil vellum and NEW Hello Honey DSP, to create this card for Mojo Monday 346. These colors are pretty fun together and the gold sparkle brad, which are retiring, matches the Hello Honey perfectly! 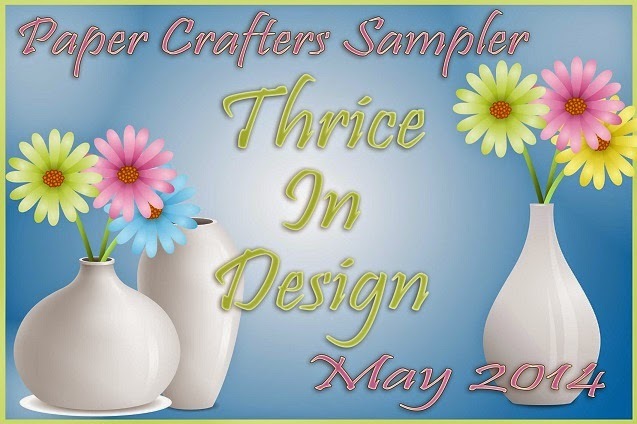 We've put together a fun yet challenging Sampler together for May. This month offers three times more flair than the previous issue. The request this month varied from holiday and seasonal issues we've had in the past. Our May issue, "Thrice In Design", takes a whack at design projects with trio's, three's and third's in mind. Each project simply had to contain "3" of something, be it images, layers or shapes. Once again the design team pulled through and the creativity of each project shows. This post is for Freshly Made Sketches 136. I thought this sketch worked perfect for the old set Great Grad. It came together quickly. I'm also trying to use up all the SAB designer paper.